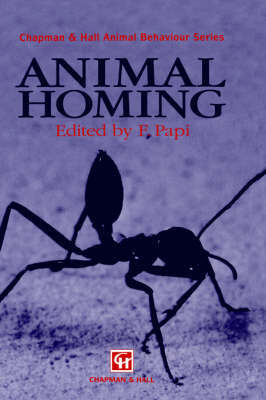 Homing phenomena must be considered an important aspect of animal behaviour on account of their frequent occurrence, their survival value, and the variety of the mechanisms involved. Many species regularly rely on their ability to home or reach other familiar sites, but how they manage to do this is often uncertain. In many cases the goal is attained in the absence of any sensory contact, by mechanisms of indirect orientation whose complexity and sophistication have for a long time challenged the skill and patience of many researchers. A series of problems of increasing difficulty have to be overcome; researchers have to discover the nature of orienting cues, the sensory windows involved, the role of inherited and acquired information, and, eventually, how the central mechanisms process information and control motory responses. Naturally, this book emphasizes targets achieved rather than areas unexplored and mysteries unsolved. Even so, the reader will quickly realize that our knowledge of phenomena and mechanisms has progressed to different degrees in different animal groups, ranging from the mere description of homing behaviour to a satisfactory insight into some underlying mechanisms. In the last few dacades there have been promising developments in the study of animal homing, since new approaches have been tried out, and new species and groups have been investigated. Despite this, homing phenomena have not recently been the object of exhaustive reviews and there is a tendency for them to be neglected in general treatises on animal behaviour.